All this by way of celebrating 11 years of Franklin Matters. 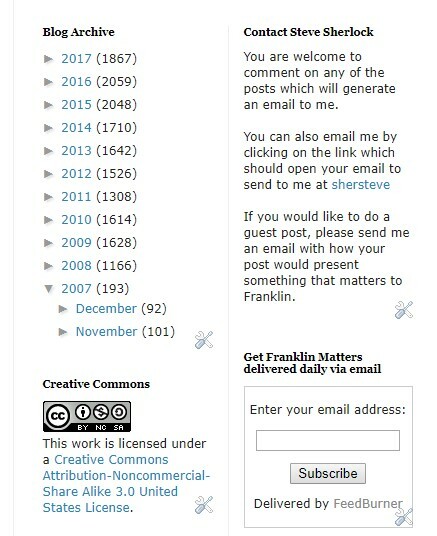 The webpage (Franklin Matters.org/) was born 10 years ago. My reporting on Franklin matters started the year before that. I am looking forward to continuing the collaboration for many more years! We do foster respectful conversation and discussions. My disclosure statement can be found here. You can read the story of why Franklin Matters! Reporting on meetings can be done live (in person) or real-time (via the cable or internet feed) or on a delayed basis (via the video on demand). The distinctions are explained here. Please Note: Your privacy and effective use of your time is top priority with these subscription options. I do not use your email for any other purpose.